Walmart stores are often a frustrating and exciting source of exclusives and bundles in November. 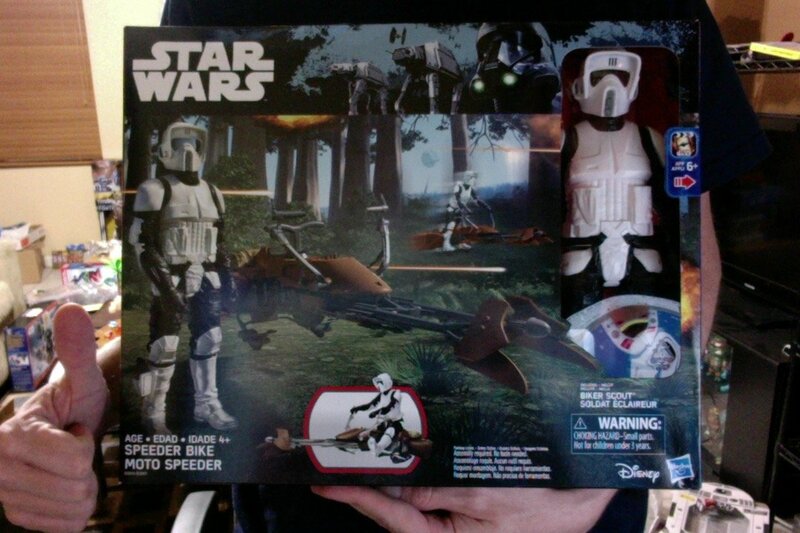 This year, the "we were told this was canceled" Rogue One Star Wars Titan Hero Series vehicle assortment arrived at Walmart in aisle dumps along with Poe/Speederbike, Stormtrooper/Assault Walker, and some Marvel Mask/Figure 2-packs. At $10 a whack they're spectacular values for kids and something collectors in 20 years - when Titan Hero Series becomes the Mego of this generation of children - cost more than a trip to the movies for your family. But hey, you can go get these now if you're lucky. The lines aren't necessarily terrible in all locations, and if you're one of the many toy vampires out there the after hours shopping trip will do you more good than refreshing your social media feeds and postponing sleep another hour or three. Hasbro's PR team kindly sent along a press release with many new and some neewish exclusives! More are coming this fall, but for now, here's a look at what you can expect on (or around) Friday, September 30. None of the 3 3/4-inch figure exclusives are listed here, but 6-inch, prop replicas, Nerf guns, and more await you after the jump. That first trio of The Black Series 3 3/4-inch action figures are hitting Walmarts now - that's the good news. I spied two of them personally yesterday, neither of which seem to be significantly altered from previous releases. Each figure is $12.93, and comes boxed. Darth Vader is a repack of the classic 500th Darth Vader mold, and now we know the dome is not glued down - the sample I saw was floating around freely in the box, the figure loose and the helmet wedged down below. Chewbacca appears to be a repack of the 2004 Original Trilogy Collection Vintage figure, which was $9.99 (and cheaper) and also repacked several times since then. I was not able to confirm if Luke has any changes, as he was not available at the stores I examined. The Walmart exclusive 2.5 foot Star Wars Rebels Millennium Falcon is now available for pre-order online. Features include a rotating radar dish, turning canon, and label sheets for $59.96. Click here to pre-order yours for an expected 10/07 ship date. The third time is the charm! We got R2-B1 before in 2000 and 2007, but this is the one you'll want. This "newly" released hard-to-find Walmart exclusive started hitting big in the last week, so did you get yours? And should you? Read on! 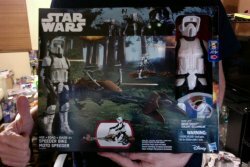 Walmart DTF Battle Packs BACK ONLINE!!! The Walmart Discover The Force exclusive Royal Starship Droids and Mos Espa Arena Battle Packs are now BACK available online at Walmart.com for $24.96 each! Save time, gas and shipping and choose Site to Store to have it delivered to your local Walmart! Hurry before they're gone! Walmart screwed up, and it's to your benefit, Hunters. They've marked down ALL their Vintage Collection basic figures to $4 (regularly $8.96). ALL means the latest The Phantom Menace and Blu-Ray Deleted Scenes waves (if you can find them). The 1999 party continues and it's happening at Walmart. The Discover The Force exclusives are now being put out just in time for the release of The Phantom Menace 3D this weekend. Our initial concerns about single case assortments being found have been proven unwarranted by the wonderful revelation that Walmart stores (most of them anyway) will be placing a POS display with all 17 exclusive pieces including 12 figures, 2 Battle Packs, 2 Vehicles, and the Qui-Gon Jinn Electronic Lightsaber. Discover The Force indeed!